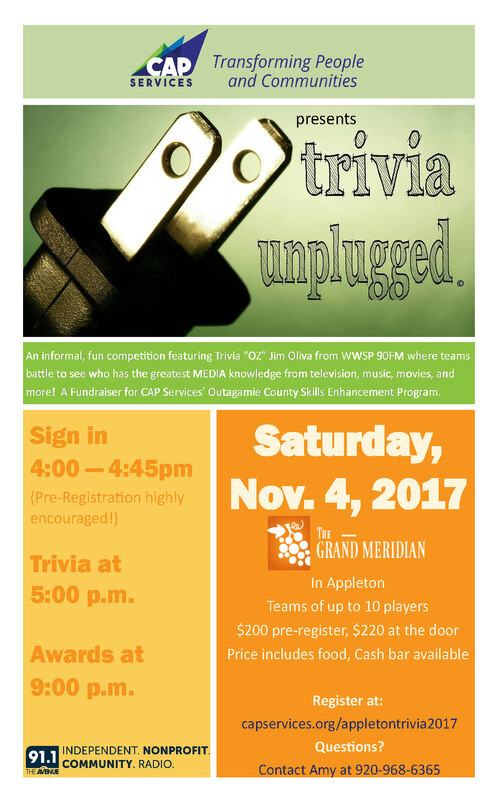 Appleton Trivia Unplugged 2017 – CAP Services Inc.
Trivia Unplugged, a fun twist on a popular central Wisconsin trivia contest, will be held at the Grand Meridian in Appleton on Saturday, Nov. 4, as a fundraiser for CAP Services’ Skills Enhancement Program in Outagamie County. Register and pay by credit card online. Entries must be complete by 5 p.m. Thursday, Nov. 2. Fill out form below, click send, then follow the payment link in your confirmation email to complete the registration process. Register and pay by check through U.S. mail or in person at our Appleton office. Mailed entries must be sent by Monday, Oct. 30. To register and pay by mail/in person. 1. Print and complete the registration form. Entries must be postmarked by Monday, Oct. 30. Bring your completed registration and check to the above address during regular business hours (Monday – Friday from 9 a.m. – 4 p.m.). Entries must be dropped off by 3 p.m. Thursday, Nov. 2. For general registration questions please contact Amy Verhagen at averhagen@capmail.org or 920-968-6365 x6365. If you are having trouble using the webform or PayPal gateway contact Matthew Brown at mbrown@capmail.org or 715-343-7516. Pre-registration is encouraged and costs $200 per team (day-of registration costs $220 and is dependent on available space). Team registration may be completed either online through using a credit card, or by mail or in person using a check.